Ultimately, the tables were turned. I had a week-long debate with a buddy of mine, J, about the quality of Kentucky Breakfast Stout, easily one of my 5 favorite beers on the planet. He has a fantastic palate for beer; and for all things, really - wine, cigars, food, you name it. Having tried KBS from a bottle and once on tap, he had branded it a lesser ale, claiming it as not even in Founders top 5 offerings. Them's fighting words to me. I'll sit there and take it if someone says they hate beer. Even dissing my precious IPA's won't stir me. But when a known beer lover who's a die hard stout and barleywine fan starts ripping KBS as an also-ran, it's on. Fortunately, Map Room was there to oblige as moderator. They had a Chicago Craft Beer Week final curtain event featuring KBS on tap. And did they do it right. My pal and I continued our debate on the worthiness of KBS as we waited out the KBS release. John Freyer, Founders representative, was in full apron working the grill, firing up and slinging duck sausages, et. al. 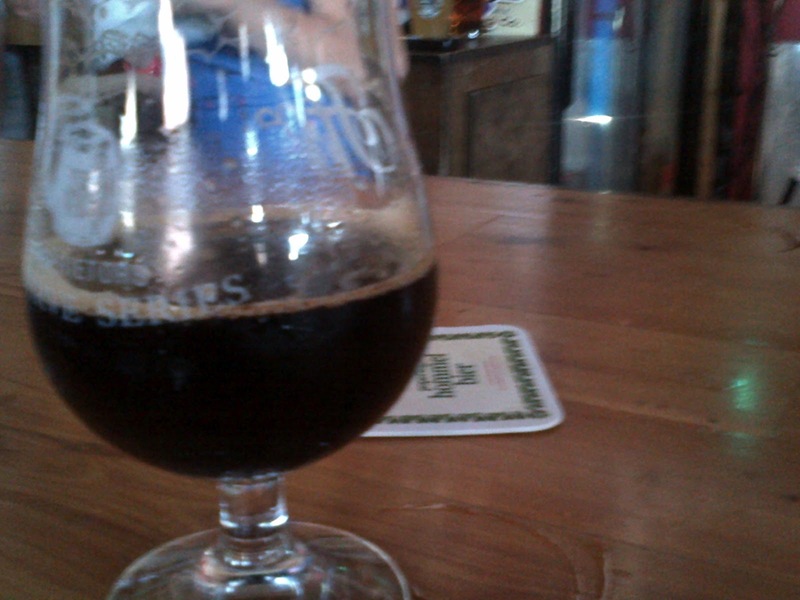 They had Zombie Dust on cask as a KBS primer, the later scheduled for a 3:30 p.m. release. The crowd began to build around 3:00 as KBS hour neared. Map Room handed out raffle-type tickets to the KBS congregation. The pouring began right after 3:30. One after another, they dispensed the inky black stout goodness from the handle. They were pouring it into everything: Firestone Walker snifters, other snifters, wine glasses, whatever they could find that seemed imperial stout worthy. Fortunately, we got the sweet FW glasses for ours. One sip changed it all for my pal. There was really no contest. This was one of the top KBS pours I've ever had. Map Room's lines are impeccably clean and it allowed the KBS to display all of its delicious glory. It came out as a dark pool with that classic brown head rife with bubbles that migrated towards the sides. The complexity was all there: chocolate, vanilla, grain, chewy oats, bourbon, coffee, raspberries, cherries. New flavors keep dipped in and out amid each sip and on the finish. It's mouthfeel is velvety smooth, buttery. The bourbony, chocolate, coffee smell just envelops you, leaving you with a warm feeling, and after you finish, in its wake your left with a glorious afterglow. KBS was truly at its best here. I'm glad I only had one as the experience would have been impossible to improve. Anyway, my friend is now a convert. Hours after I left, I got from him a "I'm on my third glass" text. Well done, Founders. Well done.